Address: 10001 Malcolm McKinley Dr. 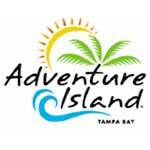 Adventure Island's 30 acres provide water soaked excitement for visitors of all ages. Ease into island time in a place where corkscrew slides, waterfalls, a giant wave pool, a rambling river, and other family attractions create a laid-back atmosphere and hours of sun drenched fun. Your toughest decision? Whether to hit the slides for some fast paced fun or grab a siesta in your own private cabana. Plan ahead and check to make sure the park is not closed because it has reached capacity. Get there early if your day is planned around doing Adventure Island. Don't forget your swim suits. Take your own food, Adventure Island can be expensive. You can relax later. Right now your job is to get whisked and siphoned through one twisted slide ride known as Aruba Tuba. Go solo or pair up with a daring friend -- however you choose to go head to head with the Calypso Coaster, one thing's for sure there's a good soaking in your future. You know what a corkscrew looks like. Now see what it feels like. This ride swirls you through 230-feet of intertwined translucent tubes giving you the tumbling of your life. This beauty of a water ride absolutely lives up to its name. But don't worry, everyone else will be screaming their lungs out, too! You'll wish you'd taken the elevator once you begin the cascade down the nearly six water-fueled stories of Key West Rapids! Imagine you and three friends racing side by side down a 55-foot drop; each inside your own enclosed tube. No matter which of the five unique flumes you choose, you're in for one wild ride. Runaway Rapids is a high-speed adventure combining altitude with attitude. The family that "Wa-hoos" together gets soaked together! This ultimate family raft ride plunges up to five riders more than 15 feet per second through a twisting, turning water flume. You never know which tube will deliver you into the splash pool when you brave the Water Moccasin. That's half the fun. Lockers, showers and changing areas make it easy to suit up. Wheelchairs are welcome, however they are not available for rent. Baby changing stations are located in the restrooms.